Photo: Paul Wellman Ms. McGonigle and the boys wrap up their weekly life skills group with a special routine. Harding University Partnership School is teaching students more than just academics. The school is providing students with life skills and offering everything from school-wide instruction on social-emotional learning to tailored, individualized plans for students who may need more of a helping hand. “We want to give them more than an academic push,” said Principal Veronica Binkley. “We want them to feel safe and a part of the school ​— ​to be mindful and present, even if home life or growing up is stressful.” In collaboration with Santa Barbara Alliance for Community Transformation and more than a dozen other organizations, Harding is focusing on children as more than just students and equipping them with skills necessary to succeed not only in academics but in life. Harding has a three-tiered approach to both social-emotional learning and to balanced literacy. “We’re equally cognizant of academic and life skills and so consistent with both sides,” said Binkley. And it appears the two are working hand in hand. As students practice and develop social-emotional skills, they become more available for classroom and academic learning, said Binkley. All students in the school learn about basic social-emotional skills and participate in classroom-wide programs such as peace circles and morning yoga and breathing. Students who may need additional support work with smaller groups to further develop life skills. Further still is tier 3 of support for students who may need more individualized or tailored support. A similar tier system is in place for literacy skills. The Independent sat in with a group of 5th-grade boys and Child Abuse Listening Mediation (CALM) counselor Jill McGonigle to talk about the boys’ experience with their weekly life skills group. The boys said they liked their weekly time in circle and enjoyed learning more about their friends and playing games. 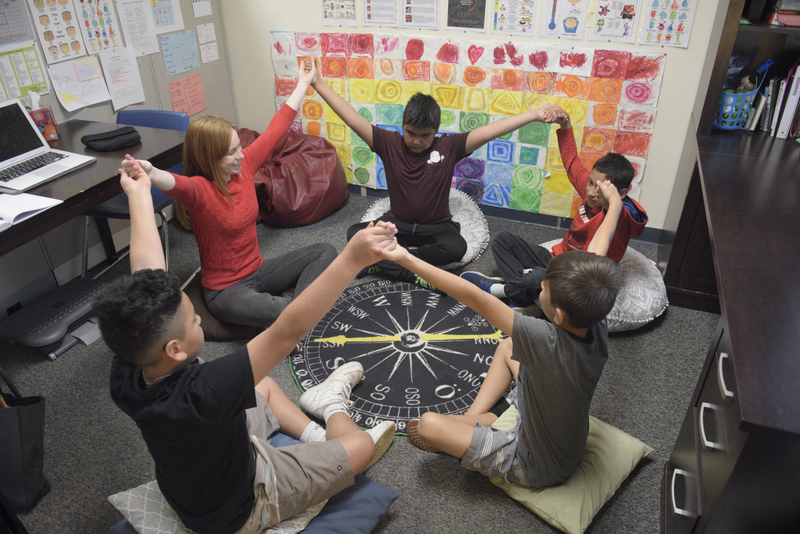 The group focuses on mindfulness and body awareness, and it provides the students with emotional regulation tools to help them tune into their bodies and identify and control feelings. Students demonstrated techniques designed to be used when they’re feeling nervous, afraid, or angry, and to help them focus in class. Photo: Paul WellmanMs. McGonigle with students (clockwise) HD, Chris, Manuel, and Sam in a life skills group at Harding University Partnership School. According to test results, it appears that social-emotional skills may be a part of the solution to improving test scores and creating a better campus climate. The school began using circles in the second half of last year and has already seen progress in student behavior and school climate. Seventy-eight percent of students reported feeling more connected and successful in the 2018-19 school year. That’s up from last year’s 48 percent. Along for the upward trajectory of a ride are the student’s test scores. The school is on track to hit a 40 percent mark for student college and career readiness. While the school is not where it would like to be yet in terms of test scores, they are incredibly proud of having all of the school’s demographic groups marked as “increased significantly” in their English Language Arts test scores, said Binkley. In order to be classified as a significant increase, test scores must increase by a minimum of 9 percentage points from the prior year. As students continue to learn life skills and participate in social-emotional learning, the number of students needing additional support continues to decrease. Ideally, only 20 percent of students would need support beyond school-wide programs. However, when the program first launched, 59 percent of students needed additional support. Within one month of implementing life-skill groups, the percentage dropped to 54 percent. This year, Binkley estimates the number of students requiring additional support will continue to drop another 20 percent while test scores are projected to continue to grow.